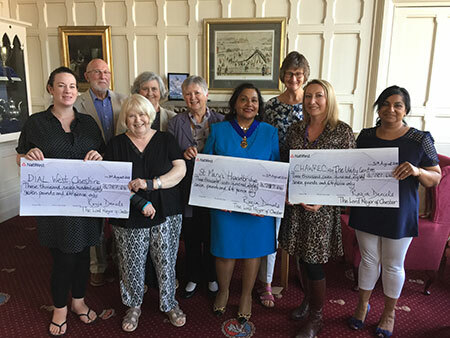 Cheques for £3,787.64 have been presented to each of Past Lord Mayor of Chester Councillor Razia Daniels’s three charities: St Mary’s Handbridge Centre, Dial West Cheshire and The Unity Centre CHAWREC (Cheshire, Halton and Warrington Race and Equality Centre). Throughout her year as Lord Mayor, Councillor Razia Daniels hosted a variety of fundraising events, including comedy, magic, music, supper clubs and an evening dinner with entertainment at Eaton Hall. Councillor Razia Daniels said: “It has been a huge honour and a privilege to be able to support three worthwhile charities who work so hard to improve quality of life and promote community spirit, which was the theme of my civic year. “Thank you to the many wonderful individuals, volunteers and organisations in the community who helped raise this money.